Many of you are familiar with the Dutch bootlegs featured in our bootleg gallery. This C-3PO hails from that series of bootlegs. 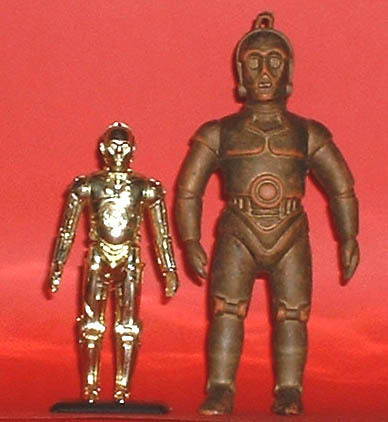 The above shot shows the Dutch C-3PO on the right. As you can see the piece is a tad larger than a standard Kenner figure. It was produced in a 5" size. There is also a much smaller version of the same bootleg available. This smaller version checks in at a measly 3" tall but sadly I do not have one to showcase yet.